Lynn English celebrates after a big rally defeats Salem. 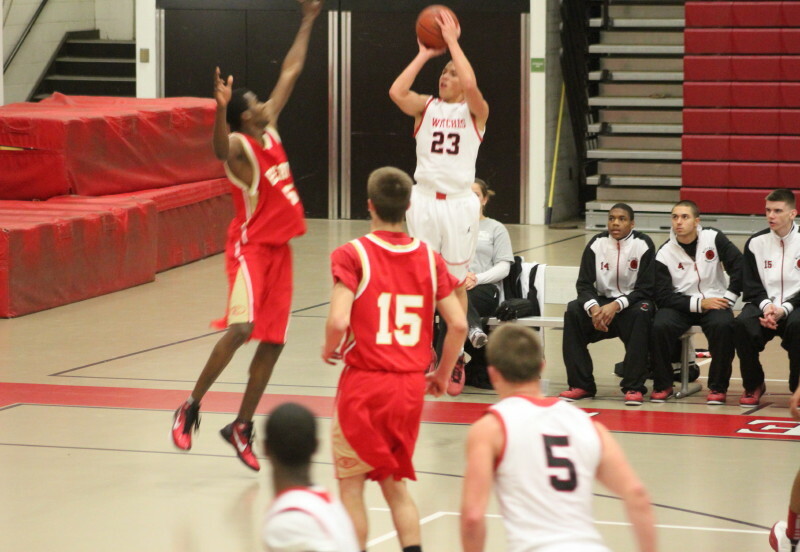 Antonio Reyes (34 points) makes a late free throw. 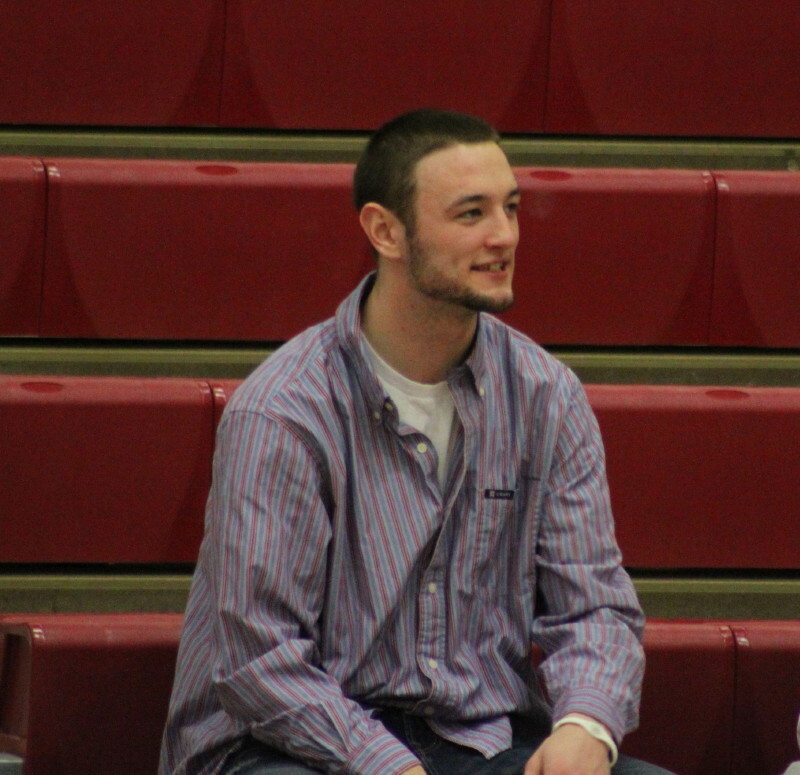 (Salem) Lynn English (17-1) trailed by ten points with three minutes left but rallied on both ends of the court and defeated Salem, 78-70, on Tuesday night before a sizable group of passionate fans. Salem (15-3) looked to be rolling to victory with a, 69-59, lead but seemed to collectively run out of gas and the Bulldogs capitalized in a big way in the final hectic three minutes. 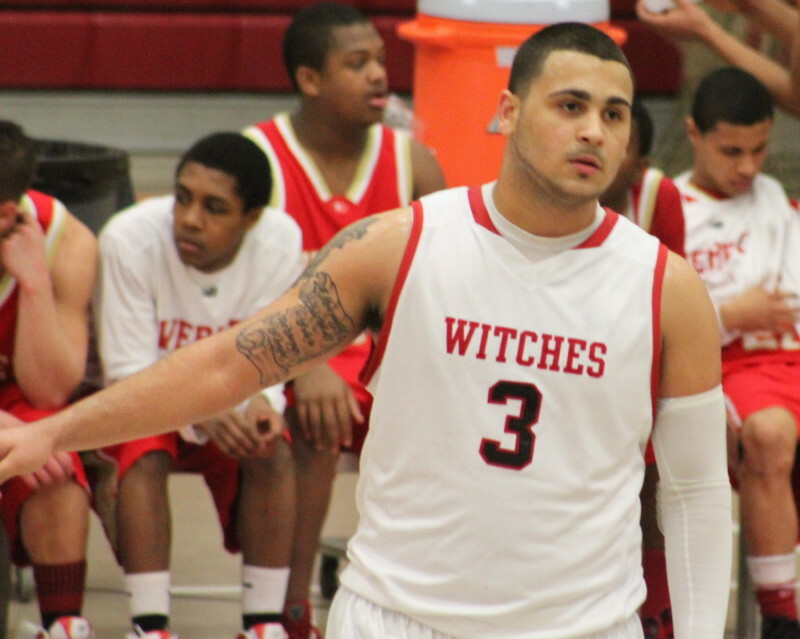 The only positive Salem had in the last three minutes was one free throw (Antonio Reyes). The rest was ugly: seven turnovers, two missed threes, and two missed free throws. While all that bad stuff was happening to the Witches, Lynn English scored at least two points in nine of their last ten possessions. After the score was tied at 70-70 with 1:04 left, the Bulldogs ran off eight unanswered points including six free throws without a miss in front of a loud Salem student section. 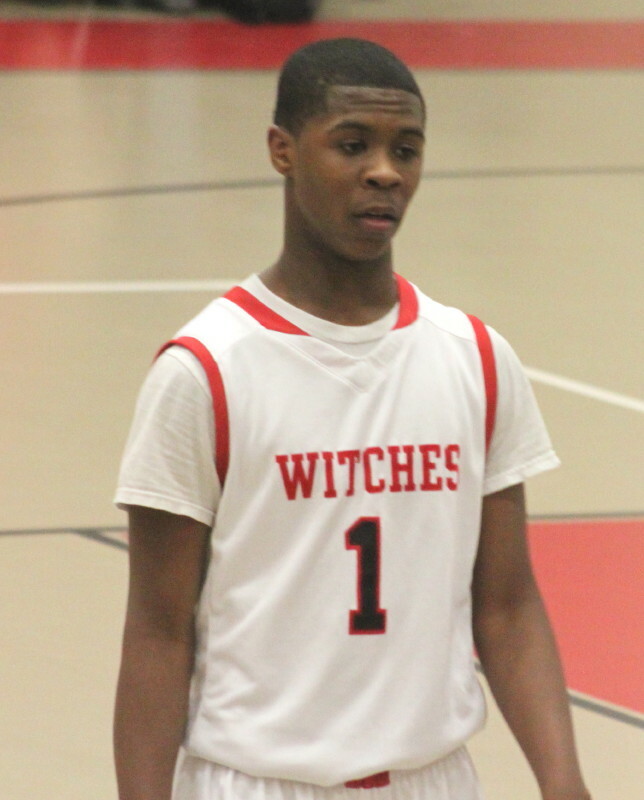 Travonne Berry-Rogers (26 points) shadowed Antonio move of the game. Here the two share a laugh. 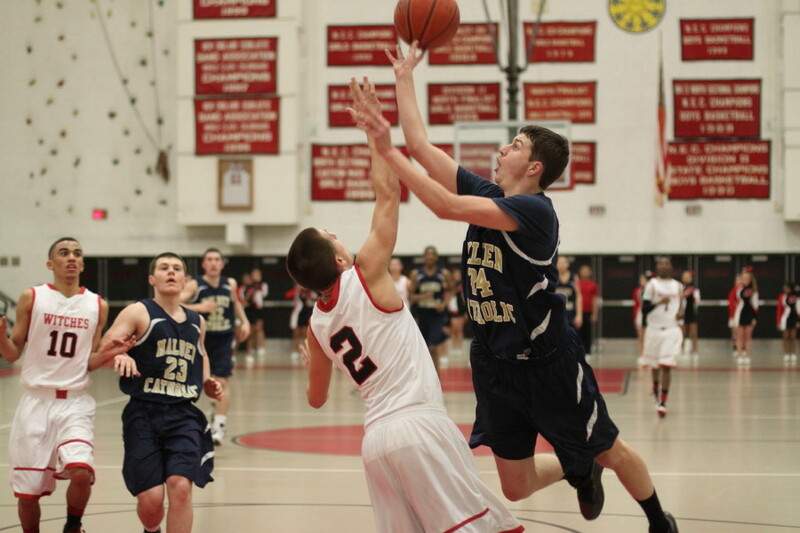 Salem had won an earlier meeting (66-63) in late December. 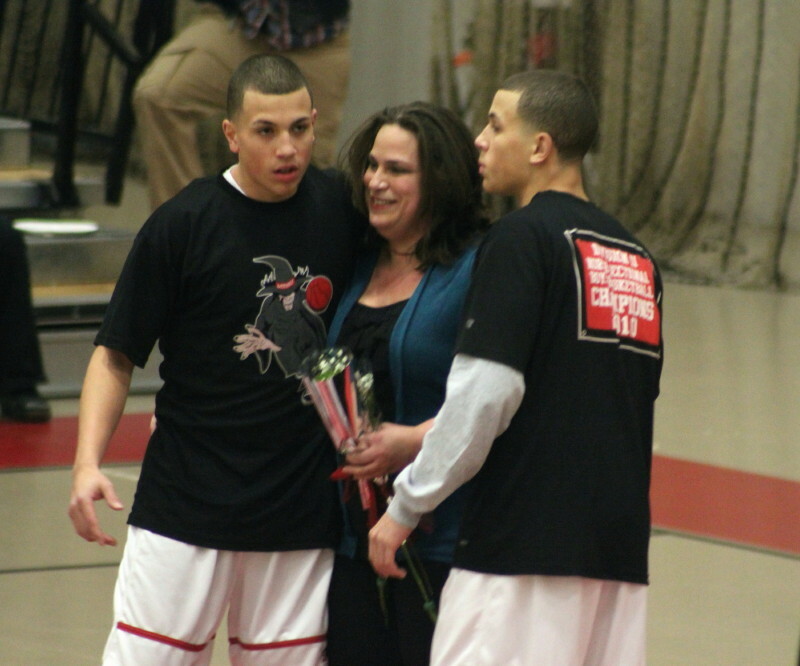 This was the last regular season home game for Salem and their seniors were honored before the game. This team will surely get a home game in the MIAA Division 2 tournament starting in a couple of weeks. 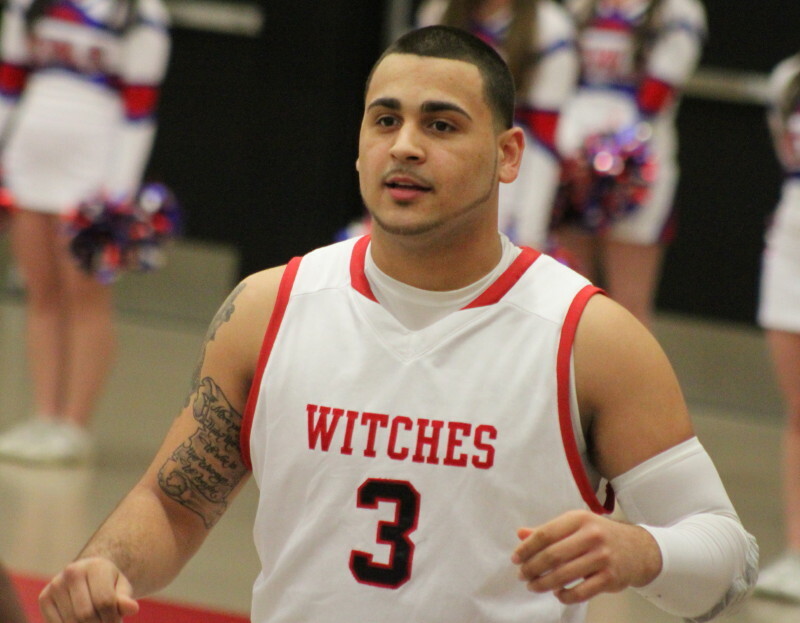 Antonio Reyes (34 points) put on one of those shows that people will be talking about years from now. 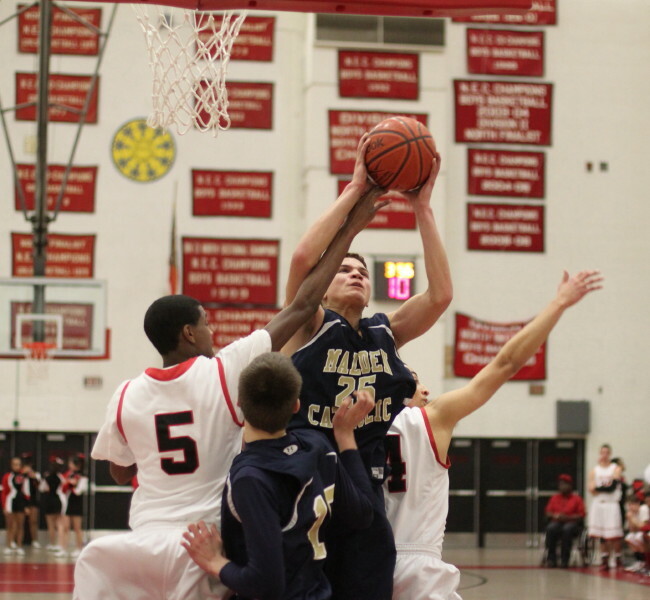 Against a team with shot blockers (Keandre Stanton and Corey McMillen) Antonio took the ball to the basket. 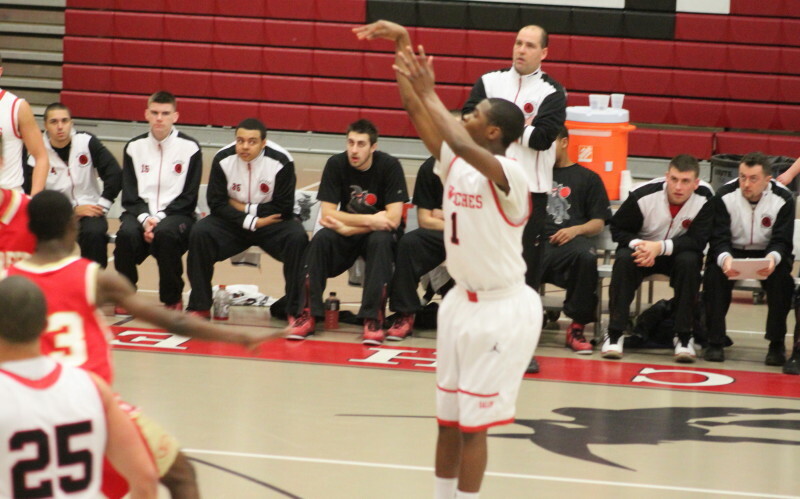 Against steady denial defense from Trevonne Berry-Rogers, Antonio found openings for 3’s. He also took in fifteen rebounds and handed out eight assists. However, in crunch time LE doubled Antonio to get the ball out of his hands and that led to a slew of turnovers that proved decisive. Antonio would foul out with thirty-nine seconds left. 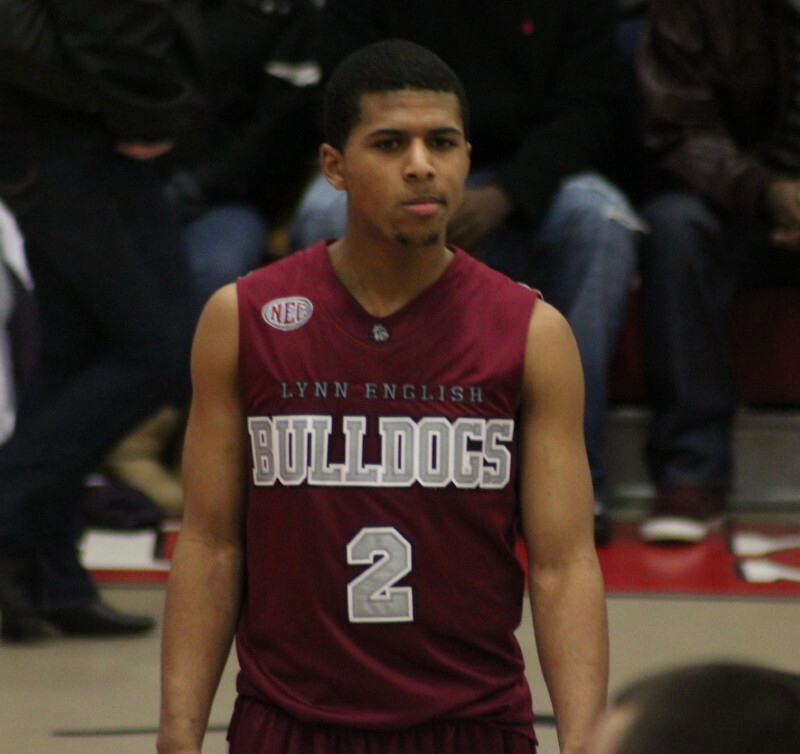 Keandre Stanton converted both free throws to put the Bulldog ahead 74-70 and Salem had no offense left the rest of the way. 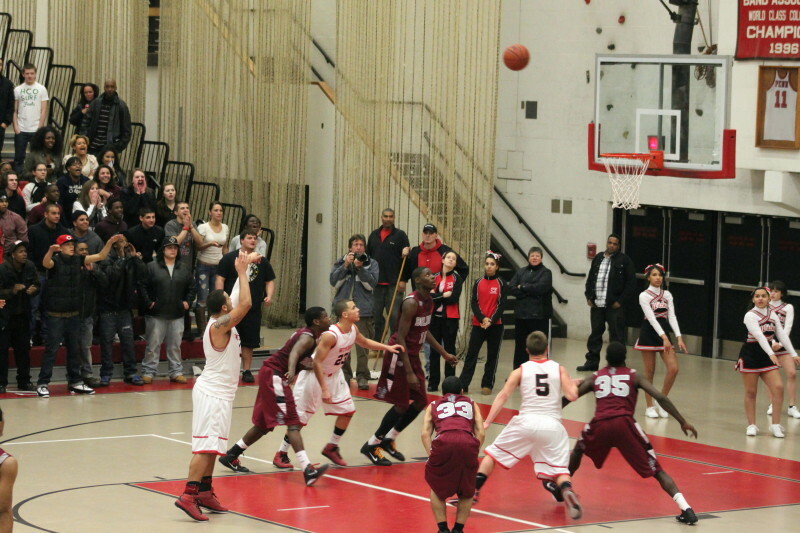 Keandre Stanton (#15) rejects a Antonio layup attempt. 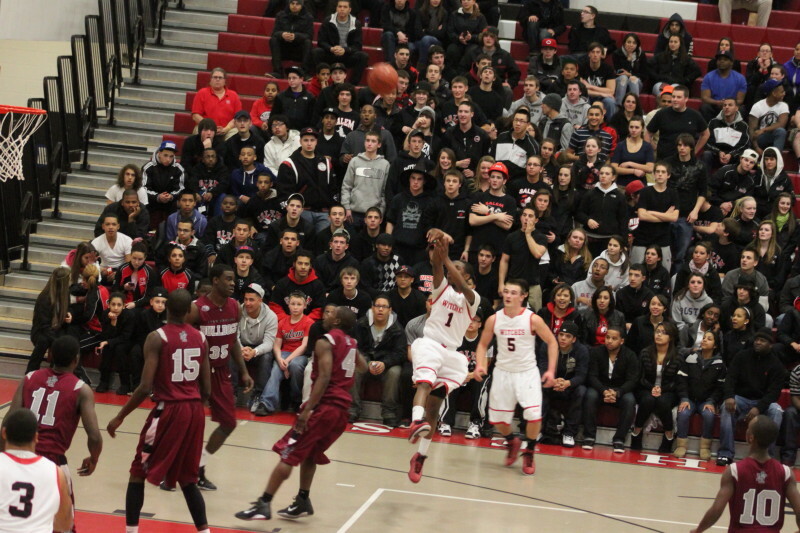 While Antonio had the fans oohing and aahing, Trevonne Berry-Rogers quietly picked up twenty-six points for LE. 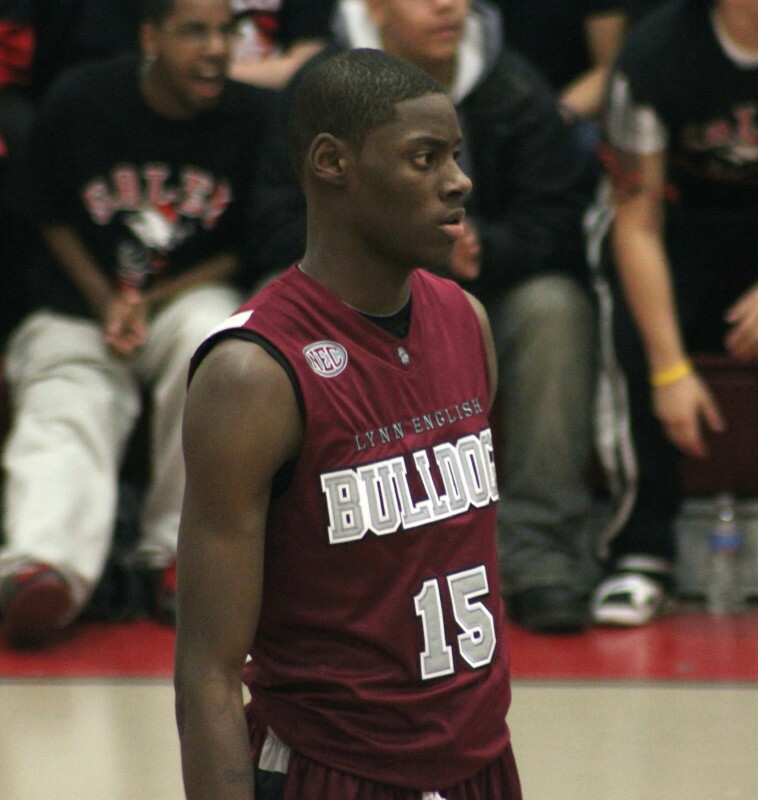 He was good from all the scoring stations and also had a big steal and layin during the last thirty seconds of the game. The Bulldogs have several serious shot blockers and when they weren’t actually blocking shots they were discouraging Salem’s undersized players from getting to the basket. Salem started fast winning all the scrambling battles. 5 ½ minutes in they were up, 17-8. 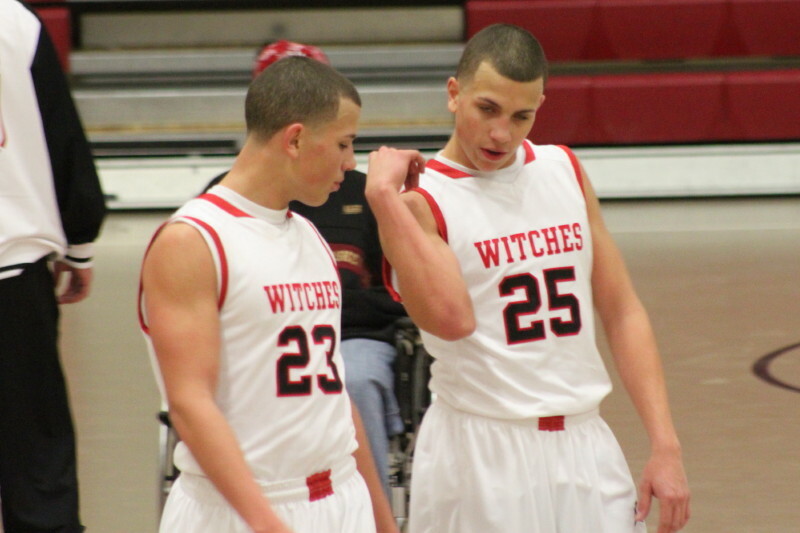 During the last part of the second quarter all that hustling around, plus having played a game on Sunday, seemed to catch up to the Witches. A 30-21 advantage was trimmed to just 33-31 by the fresher Bulldogs. Salem started the second half rested and scored the first nine points (Antonio – five points, Christian Dunston and Raphy Medrano two points each). Later in the 3rd quarter, the Bulldogs chopped eight points (six from Travonne and two from Corey) off a 48-38 lead and only trailed 54-51 at the end of that quarter. 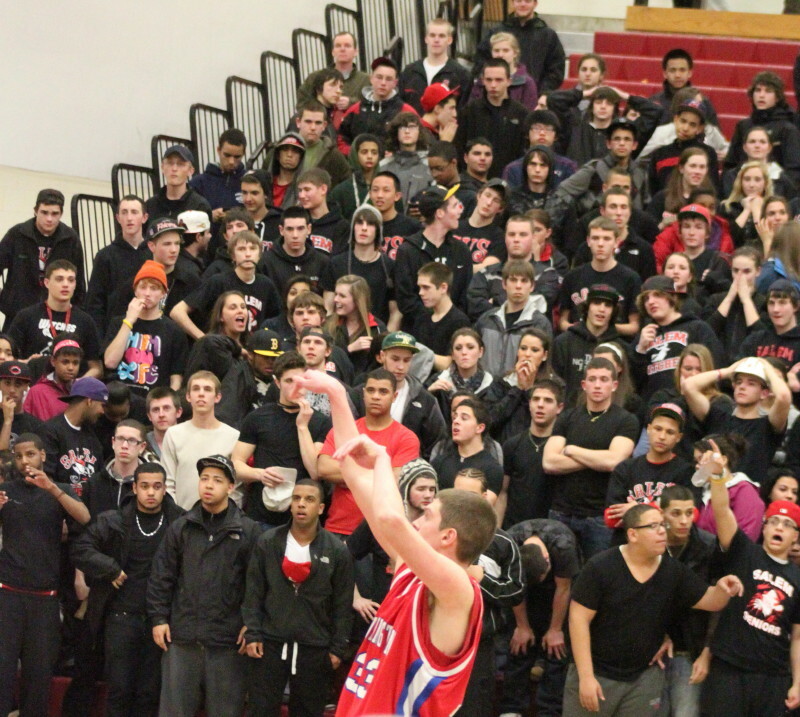 Christian Dunston (#1) shoots from in front of the Salem student section. 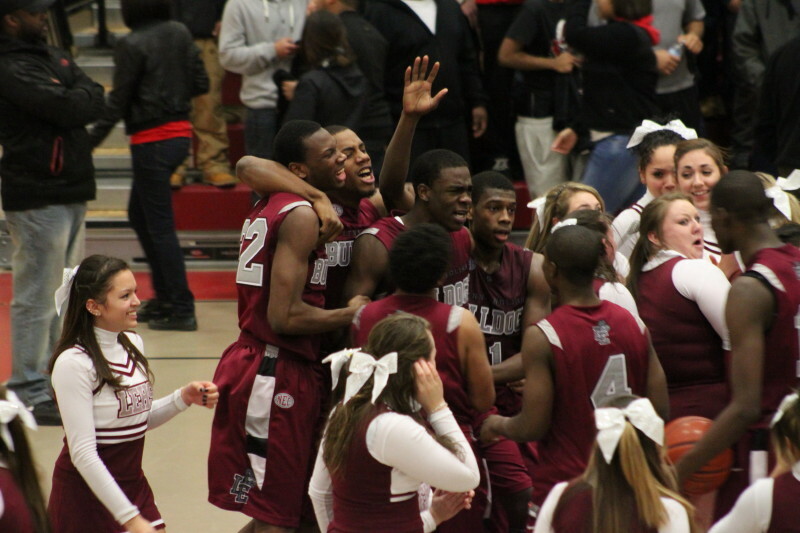 On this night Salem rallied around Antonio and pushed the lead back to ten (64-54 and 69-59) in the final period. One particular play during this good offense may have factored into Salem’s late-game demise, however. 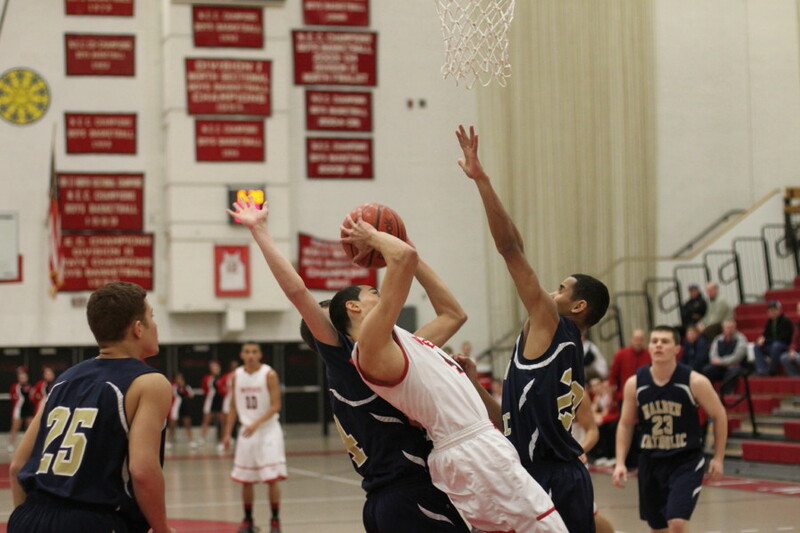 Antonio went in for a layup on the left and Keandre came over and blocked the shot sending Antonio hard to the floor. Antonio came out of that action was a sore hip with about five minutes left. 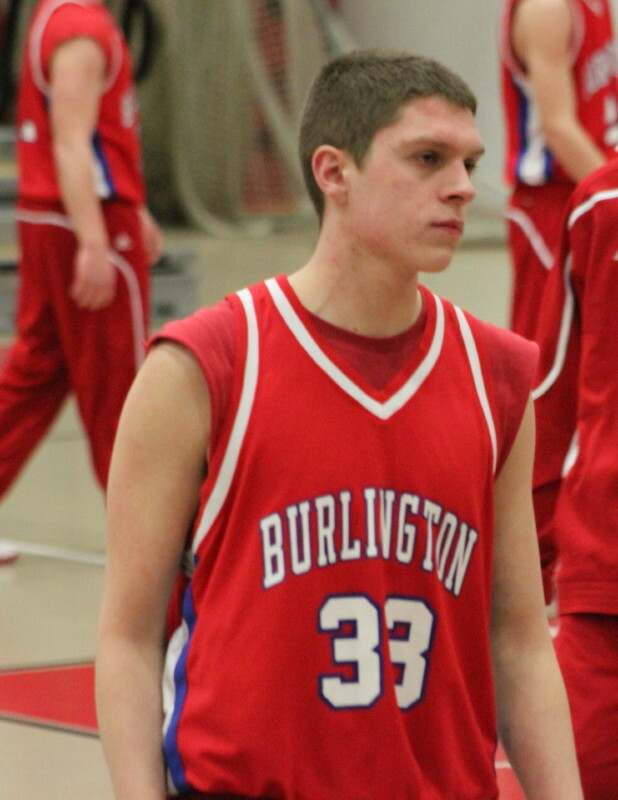 LE put together a 19-1 run during the final three minutes and avenged their only loss of the season in the process. LE has now won fourteen straight and clinched the conference title for the fifth straight season. LE had twenty turnover through three quarters. 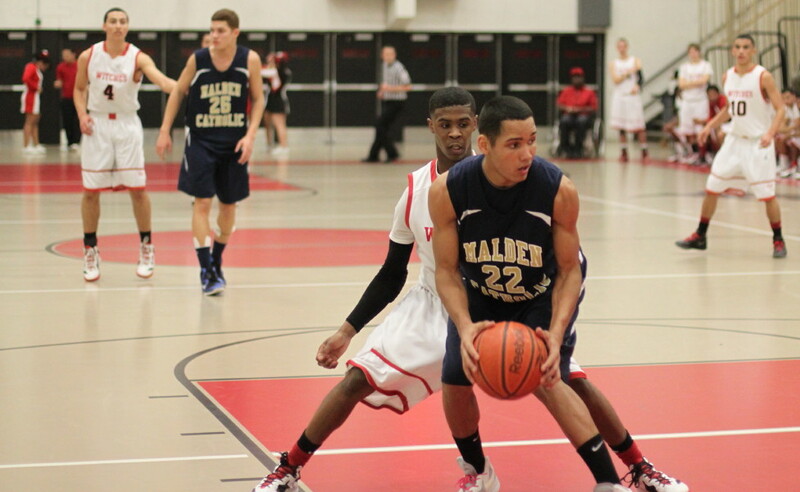 Salem played five guards and their quickness caused numerous Bulldog miscues. 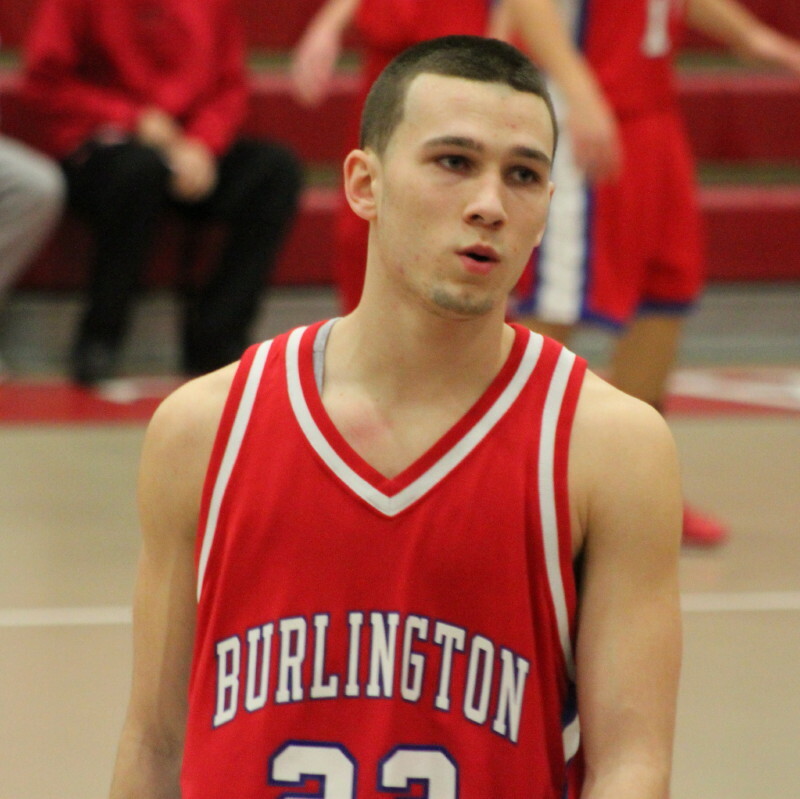 Josh Costello collected sixteen points including four 3’s for LE. 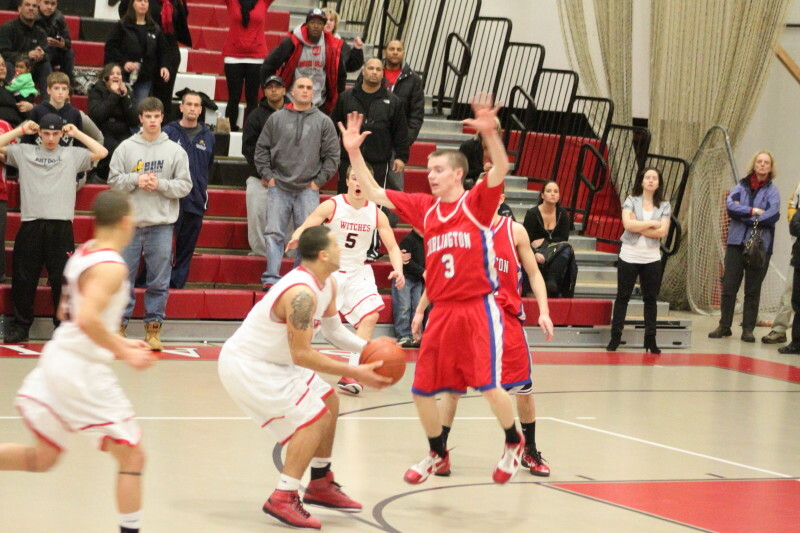 Antonio had a huge night but made the Salem attack more predictable than usual in the second half. When all five players are included in the offense, the double teams Antonio faced would have led to teammates getting open shots. 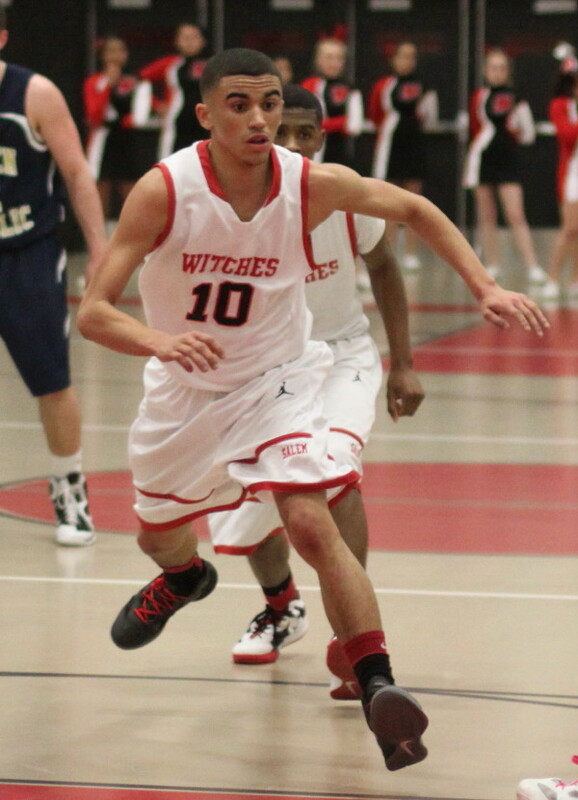 Raphy Medrano tallied thirteen points but was held scoreless in the final quarter. 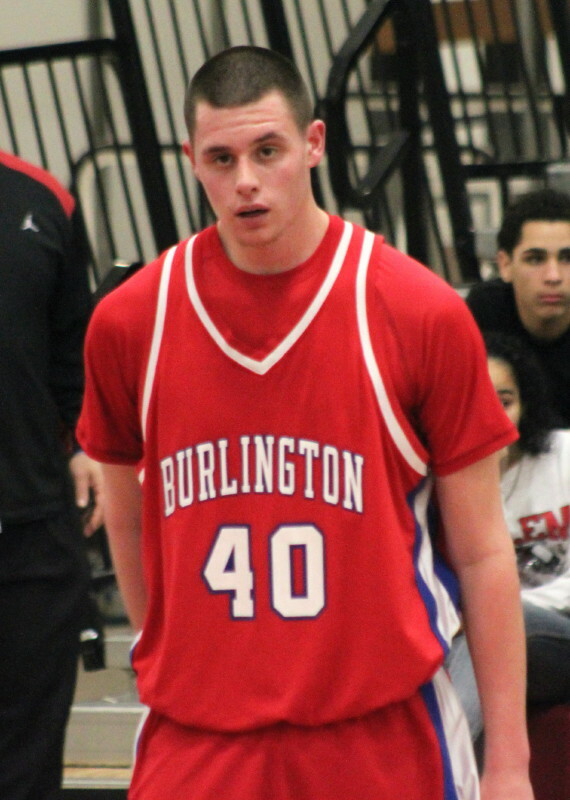 Corey McMillen (23 points) and Keandre Stanton (13 points) led the Bulldog big men. 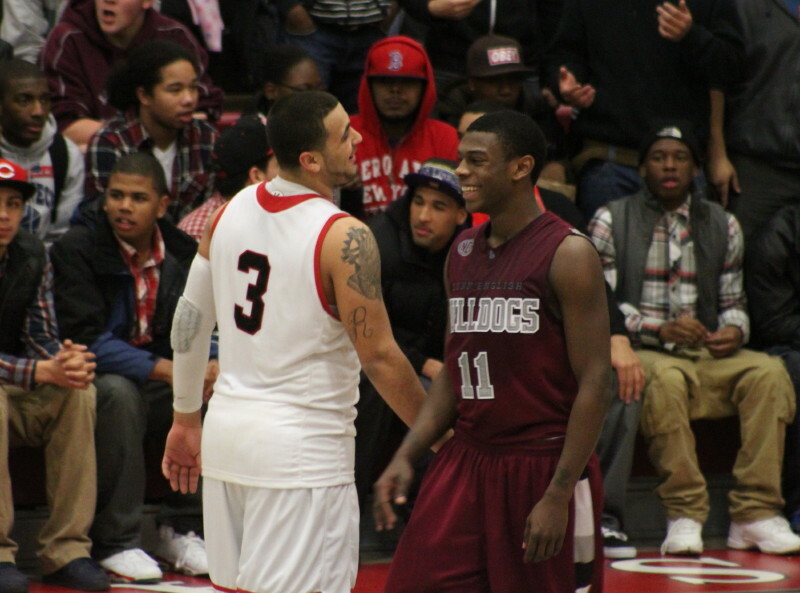 In a highly-charged atmosphere tempers can flare and things can get ugly off the court after the game. Saw none of that at Salem High. The reason? The players were respectful of each other. That set the tone for the fans. When Antonio Reyes joked with Travonne Berry-Rogers during an interlude it lessened the animosity possibilities. When they embraced afterwards you knew that the rivalry had reverted to respect and admiration. Good stuff, I thought. 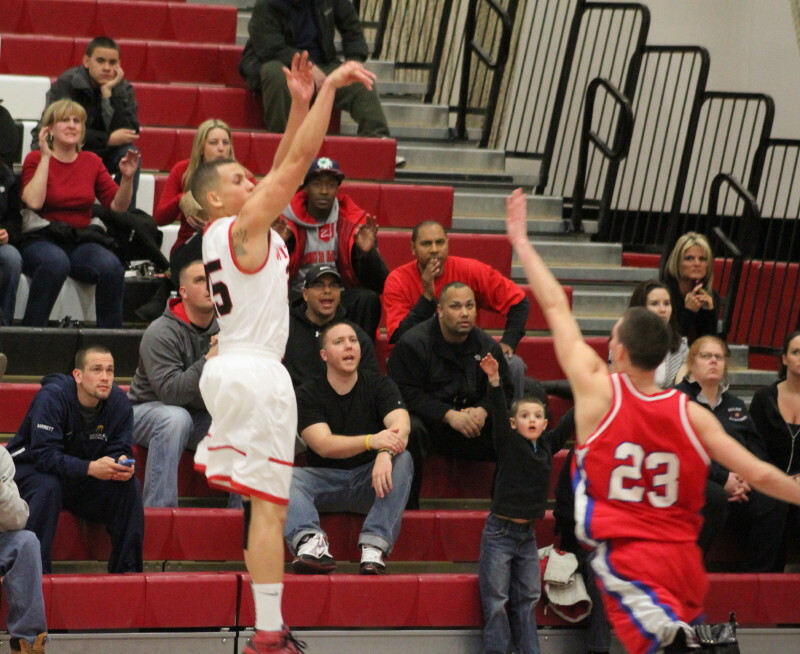 (Salem) Salem (15-2) shot its way past non-league Everett (8-7) on Sunday night, 70-63, before a small crowd at Salem High School. 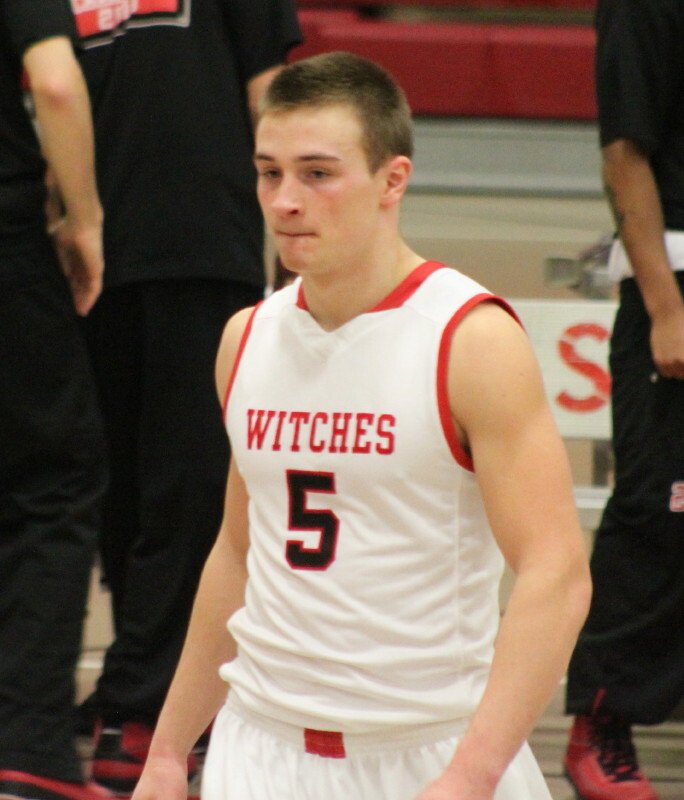 The Witches dazzled from long-distance (15-for-32) and built up a, 65-50, lead early in the 4th quarter before cooling off and enabling the Crimson Tide to make a 13-5 closing rush and cause the final score to look a little closer than it actually was. 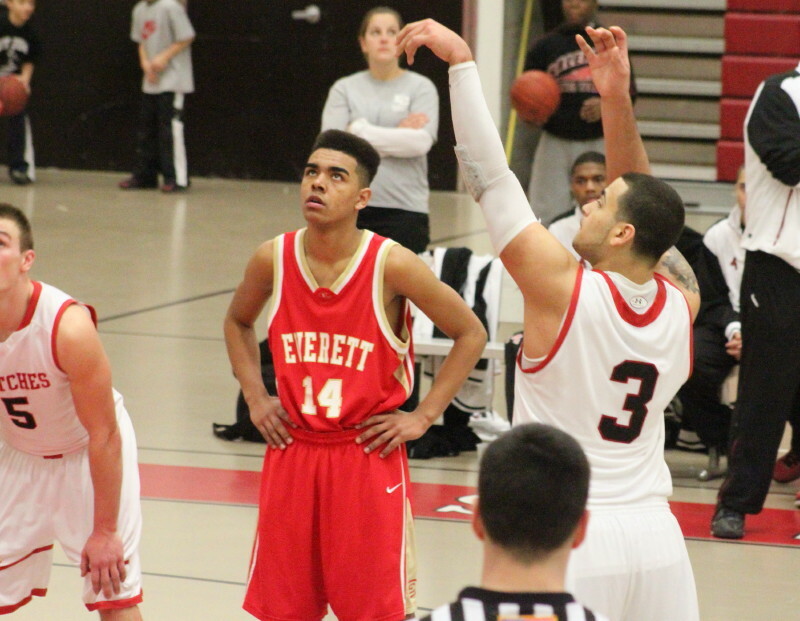 Everett edged to within six (65-59) in the last period, on nine-straight Matt Costello points, but Brad Skeffington answered with a three to seal it for Salem. 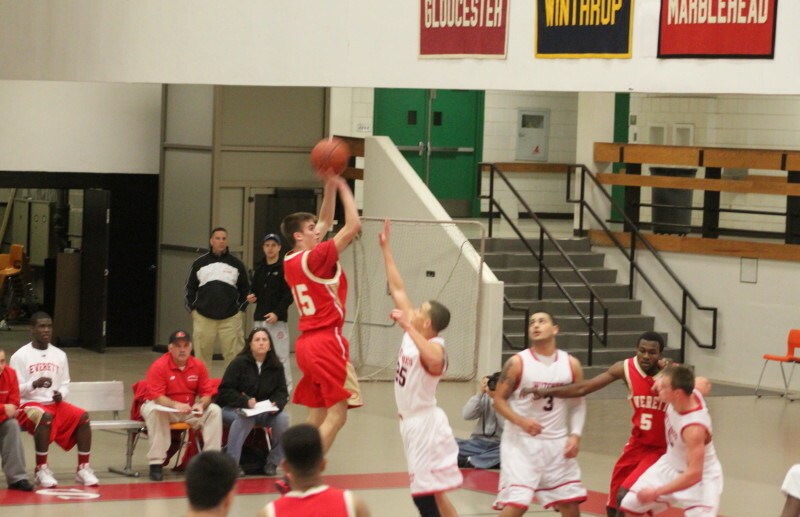 The next game for Salem is a must-see on Tuesday night (7PM) at home against Lynn English. 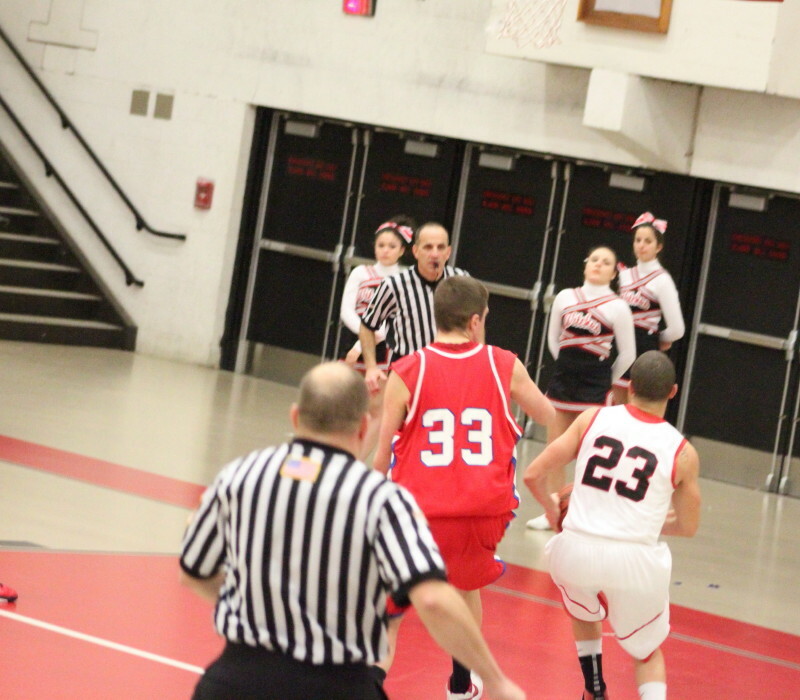 The Bulldogs are 16-1 with the only blemish a 66-63 December loss to Salem. 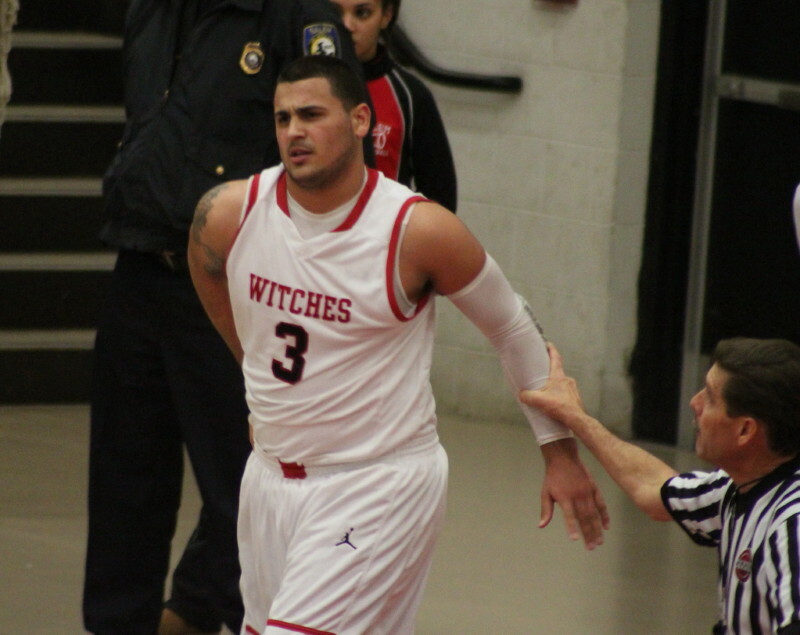 That was a game where LE had a six-point lead late and the Witches rallied around a Brad Skeffington trey to pull it out. LE has won thirteen straight since then. Salem has now won nine straight. Should be a good one. 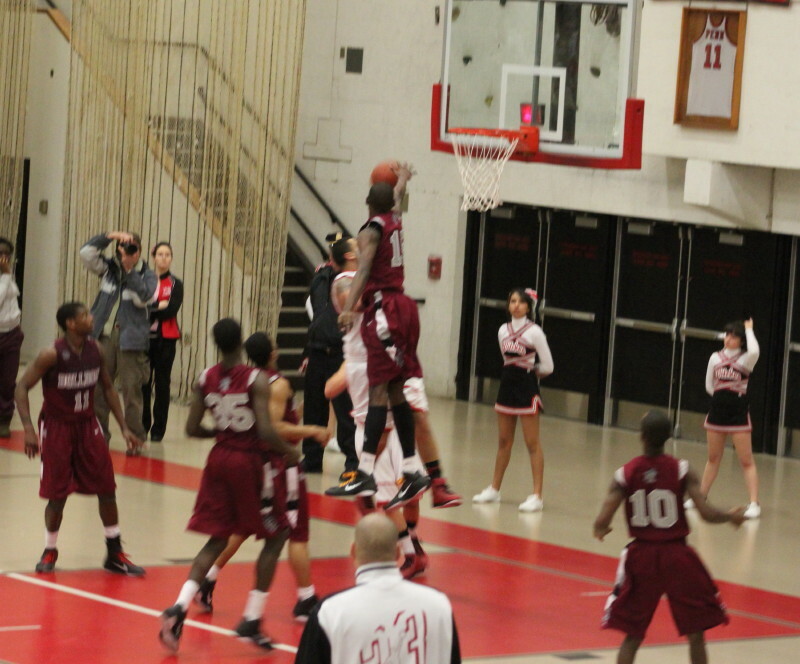 Christian Dunston (14 points) takes a 3-pointer. 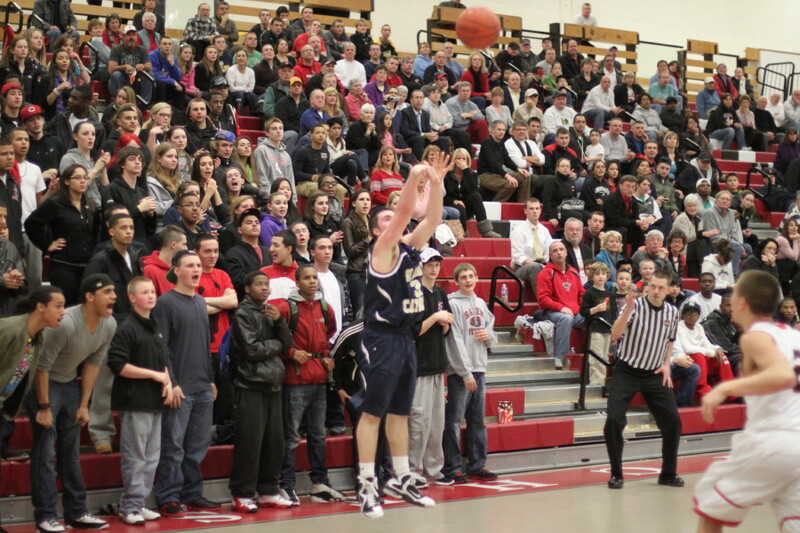 I’m sure that Salem would love to have some of the team-wide, 3-point accuracy against LE that they had against Everett. Each starter had at least two 3’s. All five starters would end up in double figures. How do you defend that?? Everett used a box-and-one against superstar Antonio Reyes and he was content in the first half to open things up for his teammates. Credit Everett. 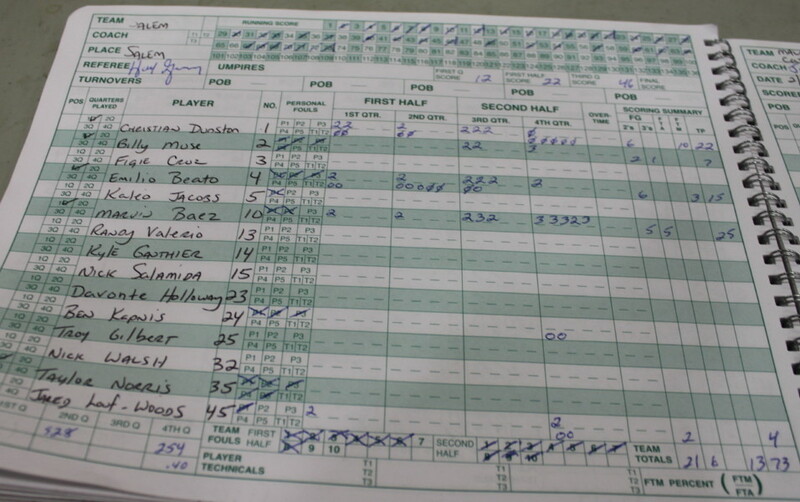 They shot well early and turned up high percentage looks and held the lead until the last minute of the first quarter. 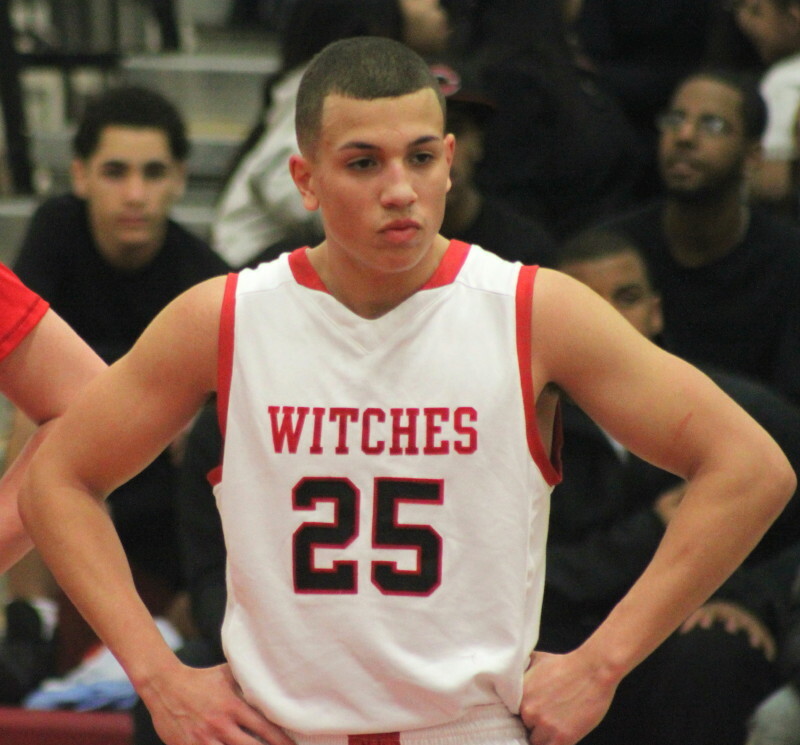 However, three’s from Dario Medrano and Antonio Reyes plus a Raphy Medrano free throw gave Salem the lead (25-19) 1 ½ minutes into the second quarter. The Witches held the lead thereafter. The Crimson Tide was still just a basket away after an Alain Jeanty layup near the end of the 2nd quarter but an eight-point Salem run, stretching into the 3rd quarter, pushed their advantage to 44-33. Three’s by Raphy Medrano and Christian Dunston plus a Brad Skeffington layup provided the points. 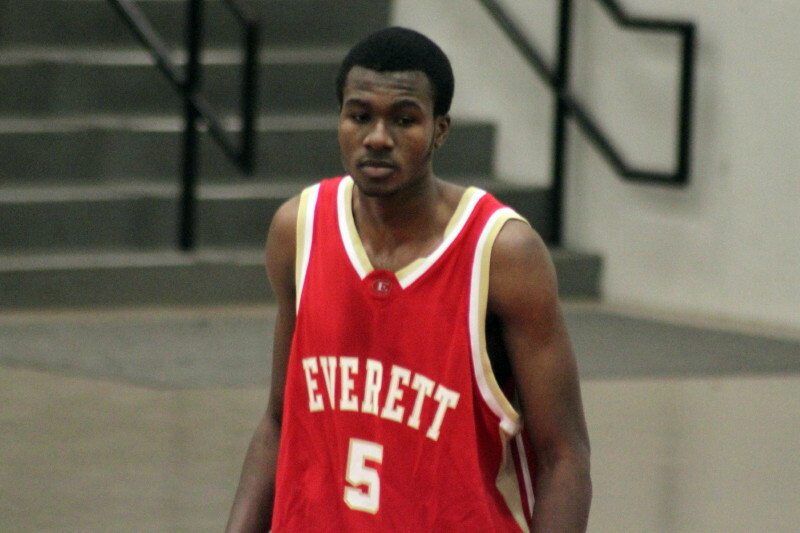 Everett rallied to 55-48 before Salem put together a game-deciding, eight straight as three consecutive Crimson Tide turnovers led to points. Antonio and Brad added two free throws each while Dario and Antonio netted layups. 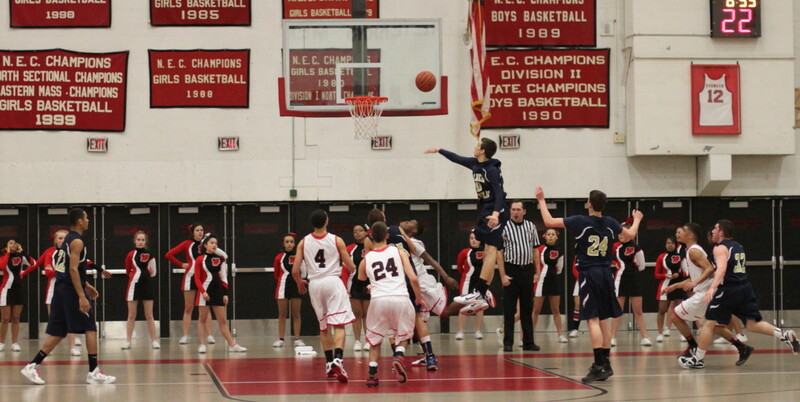 Matt Costello (17 points) elevates over Raphy Medrano. 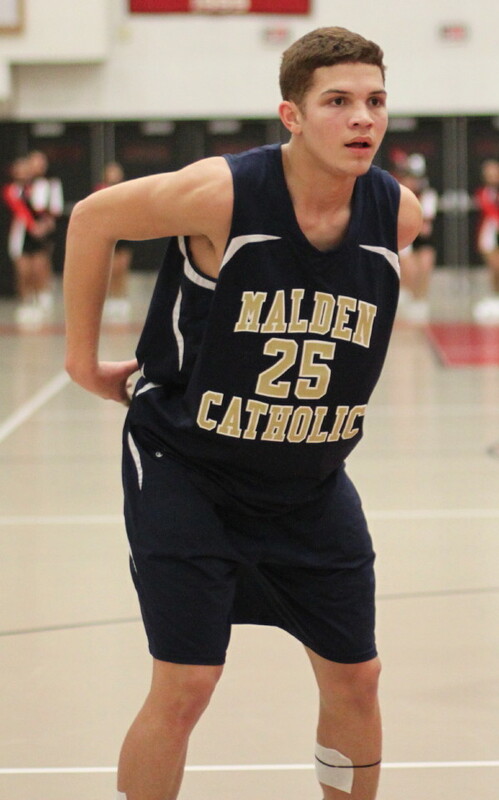 Salem’s advantage was now 63-48 and despite Matt Costello’s nine points in the last quarter this one never got close enough late to create an outcome mystery. Two things about Salem that I noticed were: (1) they play a very active zone and (2) they will pressure an opponent after a rebound. Their zone better be good because they really are going with five guards. Granted, these guards can jump, but they are guards! Defending Salem is a problem. 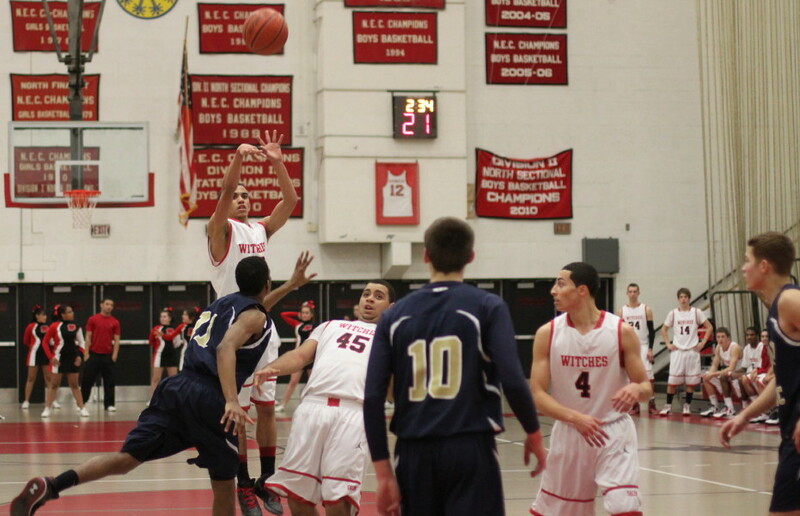 Those matchups that look juicy when you have the ball backfire when Salem has the ball. They spread the court and an opponent has to respect their long-range talent. This opens up lanes to the basket where their quickness is an advantage. Antonio Reyes was very patient with his offense in the first half. 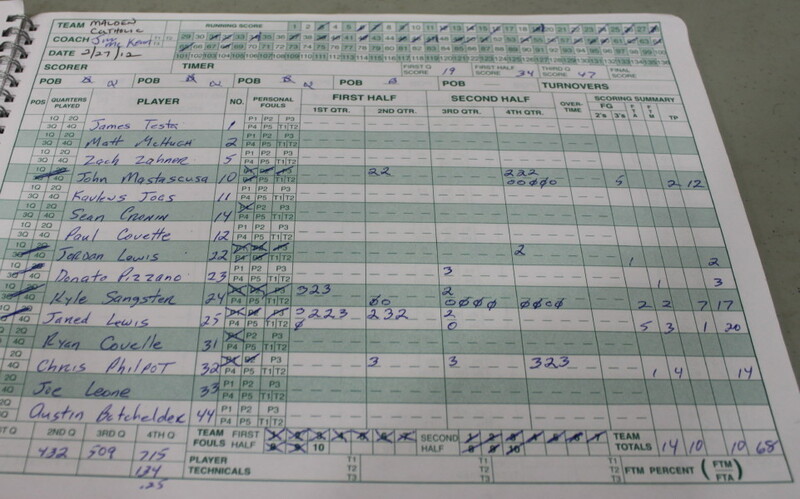 The second half he had the ball more and got to the basket and the foul line regularly. He can dominate a game. 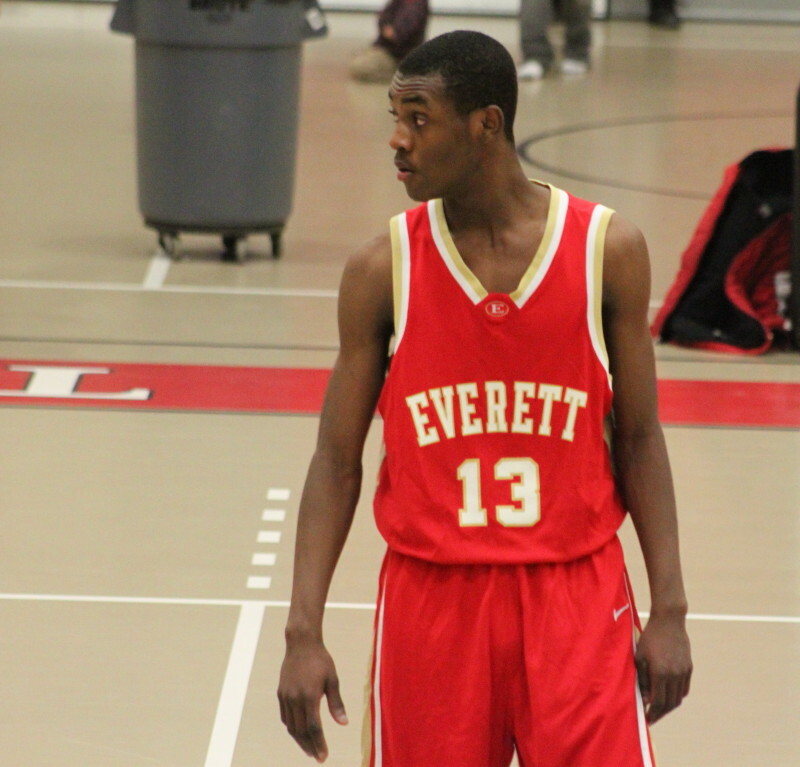 Matt Costello (17), Alain Jeanty (16) and Emo Deschommes (11) reached double figures for Everett. Salem’s starting five all recorded double figures – Antonio Reyes (17), Christian Dunston (14), Dario Medrano (16), Raphy Medrano (13), and Brad Skeffington (10).